George Kerby, a wealthy businessman played by Cary Grant has a way to enjoy his life. 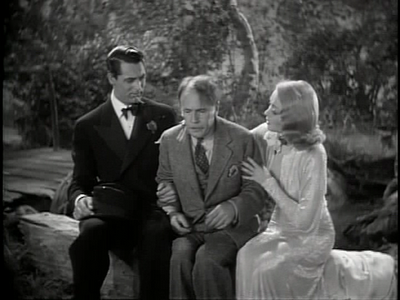 His lifestyles are complimented by his wife Marion Kerby played by Constance Bennett. This life is a contrast to that of Cosmo Topper played by Roland Young who leads a much planned and scheduled life. He is the chairman of a bank of which George is one of the board members. Controlled mostly by his wife Clara, Cosmo Topper leads a life of mechanical routine, something he cannot change and is forced by his wife to dictate matters in each and every matter of his life. George and Marion fuelled by the energetic adrenaline, die in a car accident. To enter the passage of heaven, they must do some good deeds. So they are turned into ‘transparent ghosts’. Topper upset to hear the news of Kerby’s death. He buys the car of the Kerby's and meets with an accident when excited by its speed loses control of the car. The Kerby couple introduce themselves to Cosmo. Cosmo Topper becomes a target in order to gain entry to heaven. Marion looks set to change Cosmo's life. A lot of laughs in the subsequent part of the story which tells about the mess Cosmo Topper gets into because of the pranks played by Marion and George. As a result of his new found spontaneity, Cosmo’s popularity increases and thus attract a lot of social invitations. The comical scenes are well shot throughout the movie. The hotel scene, lip stick mark on Cosmo’s cheek, Clara Topper getting annoyed with Cosmo’s new found lifestyle, Marion tempting Cosmo, Jealous George wanting to settle scores with Marion and Cosmo, the dog and house detective scene, car being driven with no driver and many more. The movie culminates when Cosmo is getting treated in hospital after he meets with an accident. Clara promises him to be not dominant in the future. Releasing the good work, the Kerby’s bid a goodbye to Topper as they head towards the gates of heaven. Released in 1937, Topper was originally adapted from a novel by ‘Thorne Smith’, directed by Norman Z McLeod. This was the first black and white movie to be ‘colorized’ in 1985. It earned two Oscar nominations – Roland Young for Best Supporting Actor and for Best Sound Recording.